Sonic & Amy, and Sally & Khan in the comics. Sonic & Amy and Khan & Sally couples The famous moment sonic and amy first went out. <3. Wallpaper and background images in the Sonic the Hedgehog club tagged: comics sonic amy khan sally couples love. why do you always get so touchy and nervous when ever somone so much as mentions a couple you don't particularly like and then you start trolling. seriously dude. everyone thinks its strange. It's just a page of the comic. I didnt post it for a fan war that clearly you love. And some of your comment doesnt make sense. how am i even trolling?and i may not like it but others do.i said that people used fake occurinces to show up their couple.real couple supporters don't need to do that. i agree, its obvious she wasnt trying to support anything with fake occurinces or just one picture. that is the real comics. @shadowxcreamftw, you know she could say that you are supporting the sonsal couple with just one thing too- the comics. which he isnt even with her consistently in. He's basically with Amy in EVERYTHING else. 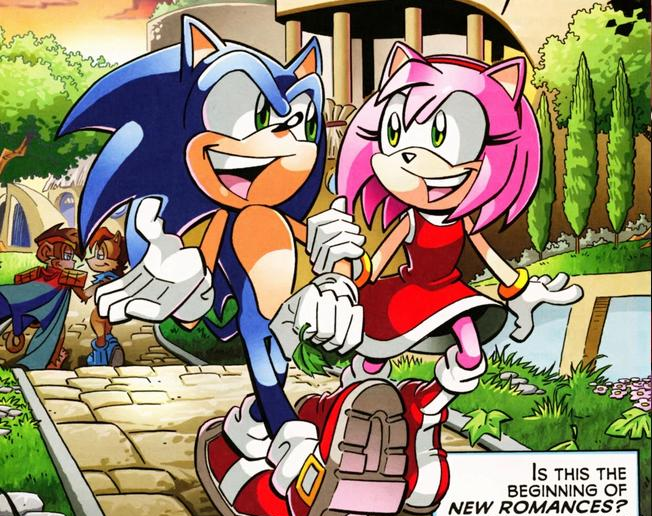 But it was true that Sonic and Amy went out in the comics- Sally was with lots of diffent guys, never that consistent. But i do agree that when Sally was with Khan they genuinely made a better couple- they even looked and acted a bit similar. i think they have more chemistry than sonic and sally who i dont really think are that perfect for eachother. According to Sega, Amy is sonics number 1 love interest anyway. and sally isnt an official sega character- hence she isnt around anymore. ^yeah but its unnecessary and its like all the time. and that is from the actual comic. wow, its just an image i posted. didnt know some people would be so offended by it. ^Um, no- O_oWtf just listed all the couples they DO like- Sonamy, Sonsal and Khansal. why do you feel the need to comment on EVERYTHING? No one really cares when you do it all the time. If you don't like the picture, no one's forcing you to comment. Poperthefox is right, your views are only 1 opinion. people like different couples. O_oWtf is also right- Sonamy, Sonally and Khansal are three real couples. and even if they weren't, it doesn't matter. People like them. IT'S JUST AN IMAGE THATS BEEN POSTED. so stop being a troll. Sonic fans do not like people that troll on couples. especially real ones. You do realise that lots of people are talking about how annoying and immature you are. ^ i agree. i don't like trolls either. i don't know why people can't just like the couples they like, maybe not like others very much, but not go ranting and chipping in to others conversations and telling everyone about it 500 times and 'correcting' people who have a different view. so strange because sonamy is a real couple too. one of the most popular lol. nice picture by the way. i have the comic that scene's in at home :) one of the best. i'm not even gonna bother reading ur comments fully i mean ur not worth it.and the troll here is all of u.everybody that calls me a troll is wrong.and y do u need to comment about my comments anyway?u say ur all good but ur rly not.U want to start an argument NOT me. I don't like arguments. but i do stick up for what I believe in, and that is that everyone can have an opinion. And you call everyone here a troll? havent you noticed that you are the only one who thinks that, and how everyone else thinks that You are? Outnumbered much? take your contradictions elsewhere, little boy, the grownups are talking. I bet anything he'll have a smartass answer to this too. Just you watch. He has one for everything else. I wouldnt mind but none of it makes any sense. You have 11. Soon to be 12 no doubt. But i do wish people would stop all of this. Okay, here's the end: some people like some couples, some like others. there. End of. I can't believe how immature some people are. I won't be commenting on this anymore, only on the picture. 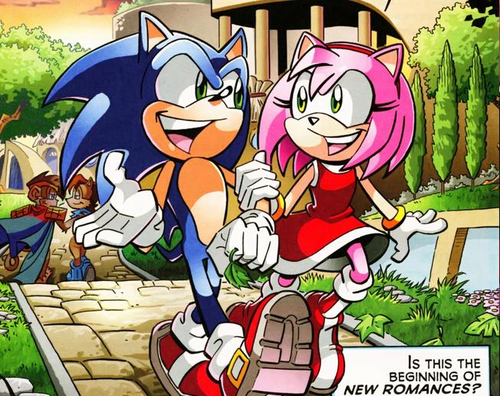 I own the comic book and I didn't like Sally and Khan together, and I'm a Sonic+Sally fan,but it felt nice to see Sonic giving Amy a chance. xD we were talking A) about the picture B)about her club. i like most of the couples like sonamy, shadouge, silvaze, tailseam, jetwave, knuxsu knuxsal and knuxikal are good too. knuckles he is good paired with different girls, he doesnt really seem to have an established couple anymore? and shadow either? i mean like sonamy and silvaze are pretty established isnt it.